Thanks to Kat at Housewife Confidential for hosting the sixth Forever Nigella Blogging Event. The Official Forever Nigella page is at Maison Cupcake. I've talked about the problems associated with seafood in a landlocked state before, but that evidently hasn't kept me from attempted to add fish and seafood to our meals. I decided I'd like to make Nigella Lawson's Nursery Fish Pie, because a) it's so very British, b) I've never had fish pie before, nursery or otherwise, and c) I was slightly afraid of it. We didn't eat a lot of fish at my parents' house (also in a landlocked state), so I had no idea if poached fish (and poached smoked fish) in a cheesy béchamel sauce covered in cheesy mashed potatoes was something I would like or not. Thankfully, since the smoked rainbow trout was so expensive, the pie was very tasty. I had to use smoked rainbow trout instead of smoked haddock, because our grocery store didn't have any smoked haddock and the fishmonger by our house promised to get some for me and didn't. Also, I used U.S. wild-caught Atlantic pollock instead of the fresh haddock because that was the whitefish that was available this week that comes from a country with rules about food safety. Plus it was on sale for $3 per pound, so I think I got a pretty good deal. I forgot to hard-boil eggs, so I had to leave those out (so maybe I didn't get a truly authentic Nursery Fish Pie), but added extra green peas to make up for it. I actually followed the recipe for the most part; I only made 1/4 recipe and discovered it was enough for four people, not two. I didn't want to risk four packages of smoked rainbow trout on a dish I'd never tried before! Half of a Nigella-sized serving was plenty (even for the husband), because the dish is very dense and rich. I did double the amount of milk for the poaching and the béchamel. Speaking of George Sanders movies, I did manage to record Lloyd's of London (1936) before the Tivo went on strike. Lloyd's of London is suitably British and maritime to go with a Nursery Fish Pie, I should think. First-billed Freddie Bartholomew (who was the biggest star out of the cast at the time) plays Jonathan Blake, portrayed as an adult by Tyrone Power (a baby-faced twenty-two-year-old in his first starring role). Blake goes from waiting tables in his aunt's tavern to working as an errand-boy for the syndicates at Lloyd's Coffee House to English spy and leader of his own ship-insuring syndicate. Quite a life! I don't know much about the historical accuracy of the script, but if other 1930s productions are any indication, I wouldn't try using this film as a source for a paper! George Sanders, in his first American production, tries to throw a wrench into the works as the suitably caddish (what else?) husband of Jonathan Blake's lady love, played by Madeleine Carroll. All in all, this is a solidly entertaining film. I enjoyed it. Keep an eye out for Una O'Connor and C. Aubrey Smith in small, but deliciously fun, roles. 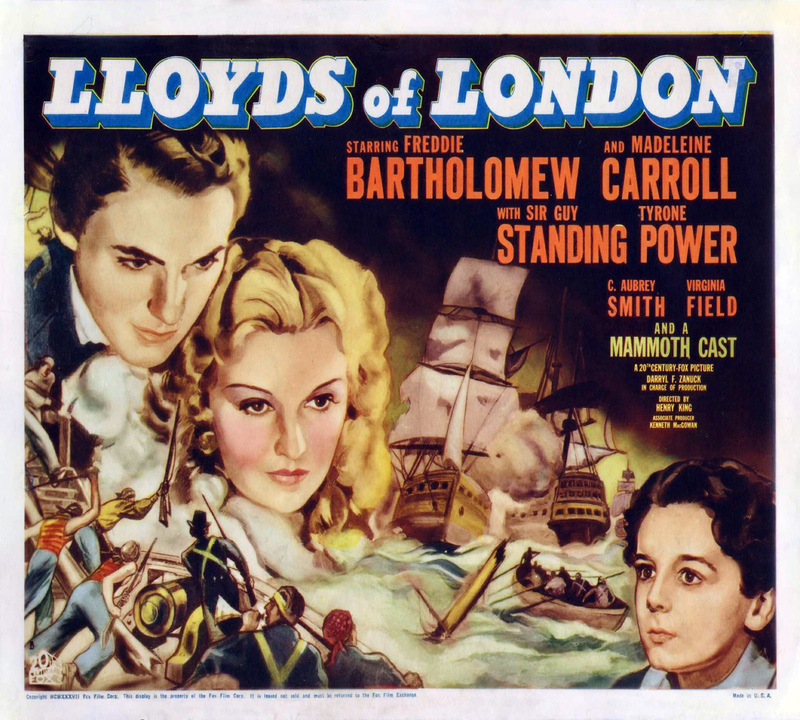 Lloyd's of London is not available on DVD, but is shown on Turner Classic Movies. Oh a fish dish, perfect! We are not landlocked and have the ability to both catch and smoke our own fish. This recipe would be a wonderful use of any flounder or sea bass we catch and it really sounds like something my boyfriend, a meat and potatoes man, would especially enjoy. Gorgeous photograph of the sky and thanks for the movie recommendation, I'll have to keep an eye out for it on television. Good luck with your Tivo! This dish sounds fantastic. We're in California, just minutes from the ocean and fish is sadly still extremely expensive. I'm a huge fish eater but never tried fish pie. Very British indeed. And "Lloyd's of London" is another great movie suggestion. Mmmm, fish pie sounds so warm and conforting. I have only made fish pie once, Delia's recipe. Somehow I feel slightly responsible for your Tivo failures! I hope Mr. Tivo recovers soon & can happily record all the TCM your heart desires! We eat a lot of fish and I've always wanted to try a fish pie recipe. This looks like a delicious one! I hope your Tivo troubles have been resolved. Okay, living in the house where you rarely (if ever) had fish, I also am a little hesitant about Nursery Fish Pie (although the name intrigues me and your pictures and description make it sound quite good)! Is your Tivo in working order yet? And even though I don't like fish, that dish looks delicious! Little baby Tyrone Power has a profile like Lana Turner! I'd never noticed how feminine it was! Now I'm going to have to see this movie. Blast. Gorgeous shot of the sky I love the idea of nursery fish pie-it sounds so soothing. So irritating when the tivo goes out . . . I'm glad you finally got to the bottom of it and I hope the landlord fixes the bad outlet fast. I like Tyrone Power, but I favored Clark Gable when I was in high school. Mmm I love her fish pie recipe, I'd forgotten about that one. Thanks for taking part! Not heard of George Sanders, thanks for enlightening me! Lauren, my eyes are drooping and I can barely stay awake but can I persuade you - in your landlocked state - to have another go at the fish pie with hard boiled eggs included? Fish pie oh how I love, love, love it. And I'd never realized, in my naive British way, that people may never have experienced the joy of a fish pie with mashed potato on top. Oh my goodness how I want one right now...! Jenny in the UK. Jenny- I'll definitely try it with boiled eggs next time--I just have to get my act together and get them made!